Whether you have a large travel trailer that you want to take for a road trip and enjoy the sights you see along your way, or you need to have a massive truck with incredible power for the work you do every day, you need a truck you can trust to get the job done. There are several choices you can make when you’re looking for a heavy-duty pickup truck that shows up with the items you need and the power that will get the job done for you on the road or at the job site. The Ford Super Duty, without question, is the truck of which we’re speaking. For the 2018 model year, it appears the Ford Super Duty is throwing down the gauntlet and has claimed the title as the most powerful and capable heavy-duty pickup truck on the market. This big brute is one we’ve trusted for many years and on many jobs but now it can do even more. It seems to be a difficult job to offer the work that this amazing truck can’t do, but I’m sure there are some jobs out there that this truck can’t do such as moving a mountain or creating a new ocean, but for everything else, this is the truck you want. 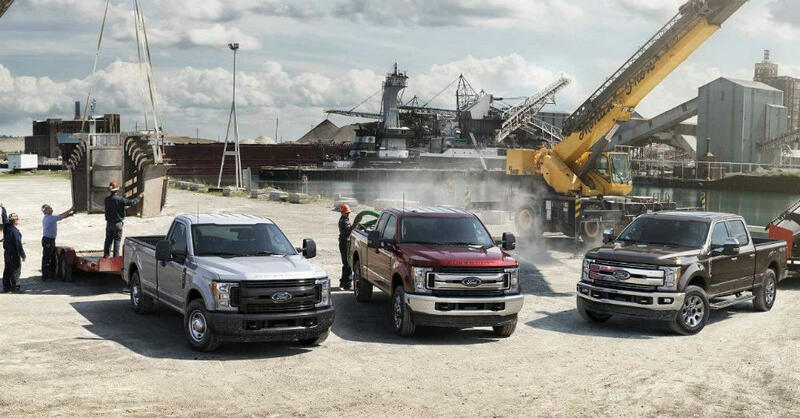 What Does the Ford Super Duty Bring to the Job? The amazing Ford F-250 is ready to head out on the roads this year with the massive 6.7-liter Power Stroke diesel engine that has been improved with ten more horsepower and ten more lb.-ft. of torque. This brings the numbers to 450 ponies and 935 lb.-ft. of torque for the drive. This incredible power allows the truck to have 34,000 pounds of towing capacity at the gooseneck. This truck also gives you 21,000 pounds of conventional hitch towing and a payload capacity of 7,360 pounds to be able to load up this incredible Ford Super Duty with what you want. In order to experience the increased performance from the engine, there is a set of redesigned cylinder heads that have been added for strength when higher loads are placed on this engine. This engine is set up to make the most use of the fuel and turbo boost to make sure the calibrations are such to give you the advantages you need. With this truck, you have the power and performance you need when you want to get on the road and experience the drive or you need to get a big job done. The F-450 Super Duty 4×2 truck gives you a dually layout for the quality ride you need. The high-strength steel box frame makes it possible for this truck to be fitted with the gooseneck you need to tow that large home on wheels you’re going to take with you. This truck is one that is offered in a variety of trims including XL, XLT, Lariat, and Platinum for the drive. This truck can be the one you’re ready to enjoy when it’s time to have the truck you want to enjoy on the road and at work to get everything done.